Got another series idea here at the Shelfie Generation. Luckily, no one can see the stack of books in my room that I intend to read… but it is way too big! That being said, I am going to put it to use by highlighting five books every now and then that I “can’t wait to read”. Some iterations will share a theme or something in relation; others will be completely random. I thought it would be fun to start today’s list with books by Women authors only. Are there any books sitting on your desk that you can’t wait to read? Please leave a comment!! The fourth novel written by one of my favorite Ghanaian authors – Amma Darko. Having read Beyond the Horizon and The Housemaid, I have found that Darko’s straightforward style works very well for a non-fiction reader like myself. Without using the word simple, I like that the prose is not distracting nor boring. Fans of extremely pretty writing may miss the lack of descriptors but I am impressed by the author’s ability to boil things down to their most basic, the essence of a situation, person or emotion. A story about middle-class Ghanaian women and their interactions with the children that live on the streets of Accra. The movie was great but Flynn’s Gone Girl included even more, deeper, twister characters than the visual adaptation. The fast paced, journal entry chapters didn’t allow you to put down the book and soon I found myself trying to guess what would happen next in a murder-mystery. Something I never do. Flynn has earned more than enough confidence that I am excited to read the latest NYT Bestseller turned motion picture, Dark Places. I expect Ghettoside to be a painfully sobering look at murder and crime in the United States. Jill Leovy is a reporter from from the Los Angeles Times and her journalistic style should make a bigger non-fiction like this very accessible. These passions first manifested in Leovy’s reported blog for the Times, “The Homicide Report”, which she created in January 2007. It was created to balance crime coverage and report on cases that weren’t high profile. Eight years later, Leovy is continuing that work in her latest book. In the beginning of the year, NPR’s FRESH AIR actually ran a story on this book (as did the NYT) with an accompanying interview including gems like this one about the difficult of truly representing murder’s consequences, “The newspaper articles I produce always paled to the reality so much. It’s so, so horrifying when you see this close-up. And I think, really, I didn’t articulate that to myself at the time, but I wanted to communicate the horror of it.“ Read the full interview here. 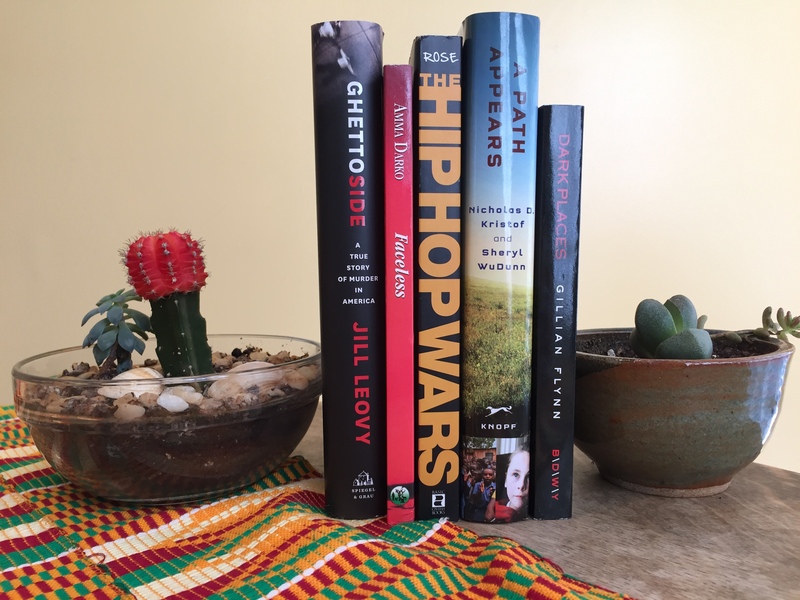 A very well respected scholar of sociology, particularly post civil rights era black U.S. culture, popular music, social issues, gender and sexuality, Tricia Rose lends her perspective to hip hop once again in 2008’s The Hip Hop Wars. I am a HUGE hip hop fan; I actually run a website based on “hip hop. More than music.” called Da-What. This book takes on topics including hip hop and violence, misogyny, hip hop’s responsibility to society and progressive future potential. According to her own website, “Rose argues that hip hop artists and the commercialization of black popular culture more generally has more power than ever to shape racial and gender images, perceptions and policies.” This book should be a discussion starter for anyone that is interested in hip hop and its socio-political implications. A woman author that is doing much more off of the page. Under the umbrella of A Path Appears, WuDunn and Kristof have put together a team of actors, advocates and producers including Alfre Woodard, Ashley Judd, Regina Hall and more to bring awareness to womens’ rights issues around the globe. They have a 3-part documentary that aired on PBS, facilitate volunteer and donation opportunities and write. The Pullitzer prize winning journalists have already published Half the Sky: Turning Oppression into Opportunity for Women Wordwide and now we have A Path Appears. This book collects a number of stories from people doing this kind of work at all levels to create one narrative of social progress.